No doubt many of my readers will be aware of the horrendous debacle at India TV which resulted in them broadcasting a report with a fake photo of Syedna Mohammed Burhanuddin (TUS) “performing” the nikah of the Taleban terrorist, Baitullah Mehsud in Afghanistan. 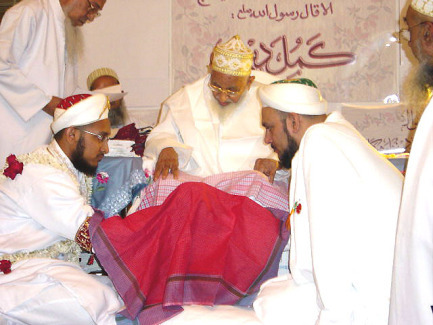 Of course, Syedna Mohammed Burhanuddin (TUS) never performed this nikah and during the time of the said nikah, Syedna Mohammed Burhanuddin (TUS) was in Mumbai, not Afghanistan. 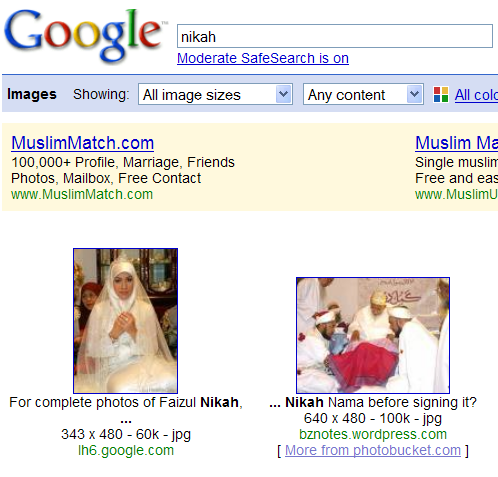 Google Search Results for "nikah"
The first usable photo became the “source” for the doctored “news report”. While this in no means justifies what happened and it should never have happened to begin with, it does mean that objectively, there was likely no intended malice towards Dawoodi Bohras. Does it excuse the event? Absolutely not. Does it mean that it’s acceptable for news stations to doctor images to fake news events? No way. Everything that happened here should never have happened. But I think it does provide an insight into how it came about. Also of interest to some readers may be the search engine referral statistics for Planet Bohra on 8 April, 2009. I’ve made these available as a PDF. Yes a distinct possiblity, as the reporter or the people at India TV may be focussed on pepping up the news broadcast. If so, it gives them a good lesson, as reporting is not merely clicking on search engines, copy – paste, morphing job. They are not paid to sit at the comp table in air conditioned comforts, and fool the masses. India TV is Best Known for it’s Fake News.90% of its news are fake and They try to Exploit people’s Religious belief by connecting their fake news with religiion. india tv knows only fake news.i would request india tv to show proper news. india tv shows irrelavent news about family matters and every thing a breaking news.